From November, 9th to 16th 2013, the city center of Eindhoven turns again into a forum of interventions, installations, performances and events based on the phenomena of artificial light. The French Porté par le vent (carried by the wind) designs poetic creations that float in the sky. During GLOW we can admire some of their creatures. With their long tails and fan-like wings they look a bit like birds or fish. 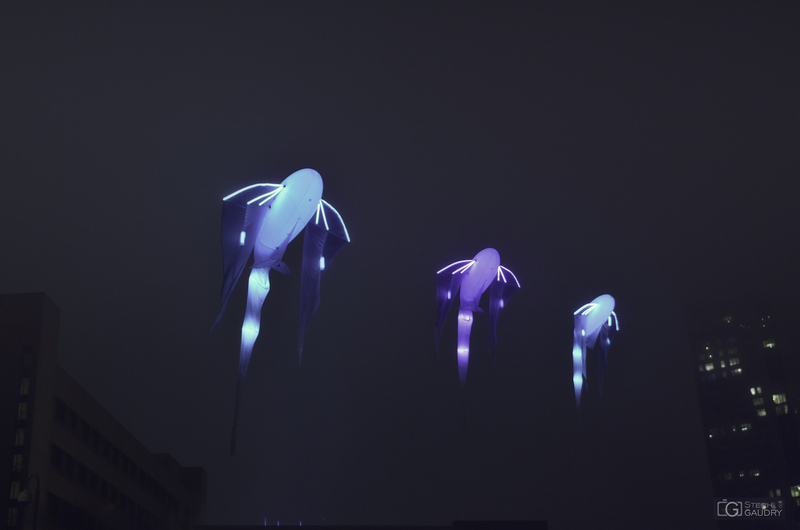 They remain at height by using a little helium and are visible in the night due to soft colored light. The magical creatures have found a pleasant living environment in the city. Above the Willemstraat they dance a nocturnal ballet. It's like they have just left the shelter of the tall buildings to show themselves to the public for a while in their full glory.